The Associate of Applied Science Culinary Arts AAS Degree program is accredited by the American Culinary Federation Foundation Accrediting Commission. This seven term program is designed to expose students to the step-by-step process of classical and contemporary culinary arts techniques and to serve as a competency-based learning experience that prepares students for a successful career within the hospitality industry. Emphasis is given to technique and ratios over that of recipes. The curriculum emphasizes applied learning grounded in theory at an estimated ratio of 70 percent hands-on to 30 percent theory. The Baking & Pastry Arts AAS Degree is accredited by the American Culinary Federation Foundation Accrediting Commission. This seven term program is designed to expose students to the step-by-step process of classical and contemporary baking and pastry arts techniques and to serve as a competency-based learning experience that prepares students for a successful career within the hospitality industry. Emphasis is given to technique and ratios over that of recipes. The curriculum emphasizes applied learning grounded in theory at an estimated ratio of 70 percent hands-on to 30 percent theory. The Hospitality Management AAS Degree coursework prepares students for immediate employment in hospitality occupations. Hospitality Management (HM) AAS will provide students with the skills the hospitality industry requires – specifically, skills in management, hospitality technology, food and beverage operations, and basic business fundamentals of marketing, customer service, and financial analysis. 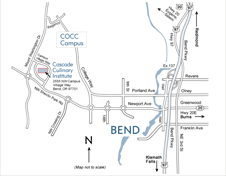 The Cascade Culinary Institute Certificate program is accredited by the American Culinary Federation Foundation Accrediting Commission. This four term program is designed to expose students to the step-by-step process of classical and contemporary culinary arts techniques and to serve as a competency-based learning experience that prepares students for a successful career within the hospitality industry. Emphasis is given to technique and ratios over that of recipes. The curriculum emphasizes applied learning grounded in theory at an estimated ratio of 70 percent hands-on to 30 percent theory. The Baking & Pastry Arts Certificate program is accredited by the American Culinary Federation Foundation Accrediting Commission. This four term program is designed to expose students to the step-by-step process of classical and contemporary baking and pastry arts techniques and to serve as a competency-based learning experience that prepares students for a successful career within the hospitality industry. Emphasis is given to technique and ratios over that of recipes. The curriculum emphasizes applied learning grounded in theory at an estimated ratio of 70 percent hands-on to 30 percent theory. The Hospitality Management Certificate is designed to give students a foundation for careers in hospitality management. All coursework may be applied to an AAS Hospitality Management degree. Beginning Fall 2016, the Nutrition and Dietary Management, Sustainability, and Restaurant Management certificate programs are no longer accepting new students. Students who are currently enrolled in these can complete their programs within COCC’s catalog year policy. Students should contact their academic advisor for additional information. Program completion may include consideration of other approved department chair course substitutions. Course Equivalencies for the 2015-2016 catalog year.